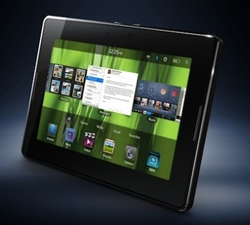 I saw reports that the new RIM Playbook had initial sales of under 50,000 units during it’s debut. I feel bad for RIM being forced to compete against Apple in a category Apple themselves defined. Being forced by analysts unhappy that RIM didn’t have an offering and then being blasted by the same analysts for the Playbook as not being on-par with Apple has to be a no-win situation for RIM. The only company that’s done well competing with Apple in this space is Google and it’s primarily because they give Android away for free. I wonder how I would sell the Playbook to companies if I was the RIM Enterprise sales rep. My only pitch would have to be the standard pitch of all incumbent vendors to the big enterprises, “We’re already your vendor of choice, we’re the safe choice, you won’t get fired buying with us, our execs know your execs, our new product is good enough, think of the huge implementation costs you’ll incur by switching.” Even some of the RIM enterprise sales reps can’t use that pitch with confidence as they’ve gone over to sell the iPhone to enterprises. Poor RIM, they have record sales of product and no respect. And poor me since I really prefer a physical keyboard so I’ll continue to use the Blackberry…for work…and get the iPad for personal use.